USAGE:- Project your iPhone (5 and up), iPod or iPad within a few seconds. 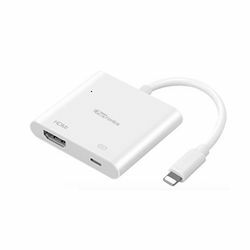 Display on a large screen of any HDMI port monitor like TV, Projector etc. CHARGE WHILE PROJECTING:- It provides continuous charging to your iOS device eradicating the low battery issues when projecting. MAKE A BIG IMPACT:- Mirrors all your websites, videos, presentation through a HDMI supporting projector, TV or any other display in 1080 HD or 4K (with gold plated HDMI cable) video quality. SUPPORT:- It supports YouTube, MS Office, Google Chrome and Face Time for a better presentation or conference meetings. Does not support apps which require copyright like Netflix, iTunes,Hotstar, Amazon prime etc. PROFESSIONAL & PORTABLE:- Easy enough to carry in your pocket and almost zero setup time. No need to carry laptops and avoid hassles of finding projector or pairing with one at client's place. USAGE:- Project your iPhone (5 and up), iPod or iPad within a few seconds. Display on a large screen of any HDMI port monitor like TV, Projector etc. CHARGE WHILE PROJECTING:- It provides continuous charging to your iOS device eradicating the low battery issues when projecting. MAKE A BIG IMPACT:- Mirrors all your websites, videos, presentation through a HDMI supporting projector, TV or any other display in 1080 HD or 4K (with gold plated HDMI cable) video quality. SUPPORT:- It supports YouTube, MS Office, Google Chrome and Face Time for a better presentation or conference meetings. Does not support apps which require copyright like Netflix, iTunes,Hotstar, Amazon prime etc. PROFESSIONAL & PORTABLE:- Easy enough to carry in your pocket and almost zero setup time. No need to carry laptops and avoid hassles of finding projector or pairing with one at client's place.